The Houston chapter of Open Carry Texas, a gun rights advocacy group, postponed an event that was scheduled for this past Sunday where their members were going to walk through the streets of the Fifth Ward in Houston openly carrying assault rifles. The event, which has not been canceled but merely moved to another date, was ostensibly also going to be a canned food drive organized with a local church. The Fifth Ward is a predominantly black neighborhood and the event was originally scheduled to take place shortly after the celebration of Juneteenth. Per event organizers, the march has been moved to another date because one of the main organizers, C.J. Grisham, was unable to attend this past Sunday, as he was scheduled to appear somewhere else where open carry enthusiasts were appearing in public with guns. Per Grisham, the neighborhood march is meant to be a community outreach attempt by Open Carry as well as a charitable affair. If you are to ask the group, Open Carry’s purpose in doing this isn’t to antagonize and intimidate, but merely to ‘educate’ others and let them know that they all have the right to carry around scary-looking assault weapons everywhere they go. Texas’ laws now make it perfectly legal to openly carry long assault rifles, such as an AR-15. Joe Deshotel at Burnt Orange Report, upon learning of the original event, checked with the local church that the event’s organizers stated they had coordinated with to do the canned food drive portion of the march. 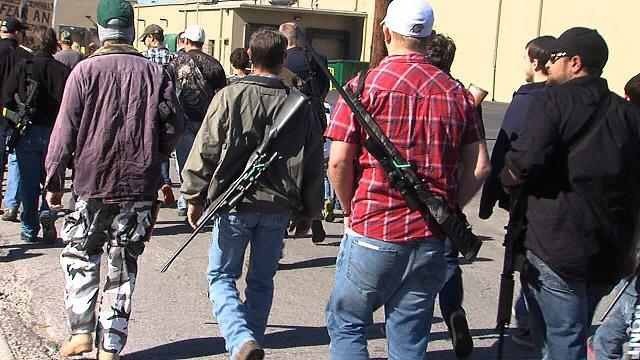 As one would suspect, the church had no idea what was going on and confirmed that they had not discussed any such drive with Open Carry Texas. It appears that the group was caught in a lie, as they were merely trying to create the illusion that this event was something more than just a bunch of nut jobs marching through a neighborhood carrying guns. Deshotel also highlighted past incidents from some of the group’s members. He provided pictures and Facebook posts from some of the members showing quasi-racist behavior. One member took a picture of himself outside the office of Rep. Sheila Jackson Lee (D-TX), who represents the ward, eating a piece of fried chicken. The Congresswoman is African American. Another person was shown holding a sign that stated that the Congresswoman supported slavery because she’s for gun control. One Open Carry member posted to Facebook that most blacks are thugs and that going to prison is no different than living at home and leeching off of the government, only the address has changed. Basically, the Houston chapter of Open Carry Texas was looking for a way to be provocative and step it up as a way of getting further press, which they have now received. I guess you can only go to so many chain restaurants and box stores in the suburbs before people stop paying attention to you. Considering that the NRA retracted their original admonishment of the group’s activities, and have essentially endorsed what they are doing now, Open Carry now feels emboldened to push the envelope and organize more aggressively inappropriate demonstrations. It seems like race-baiting is the new direction.